Artworks and artists can play many different roles. Fred Lonidier is a visual artist in the labor movement who offers his critical position as a model for us to examine. For Lonidier to be an artist in the labor movement means to have a practice based upon the understanding that intellectual and artistic work has to be guided by union organizing and struggle. In the 1970s Lonidier was part of the racial, sexual, and gender emancipation movements and joined student protests against the Vietnam War. His studies in Sociology and Fine Arts, and his collaboration with the artists Martha Rosler, Allan Sekula and Phel Steinmetz, led to his use of documentary photography as a means toward social change. Lonidier has developed a specific visual language that is defined through its close connection to social and political movements: draft resistance during the Vietnam War, the feminist movement at the U.C. San Diego campus, San Diego union fights, the struggles of maquiladora workers in Tijuana, and others. He uses conceptual art, photo-text montage and public television broadcasts to examine, investigate, expose and intervene in labor union work. Strike is Fred Lonidier’s first institutional solo exhibition in Europe and takes place simultaneously in Rome, Geneva and Zürich. 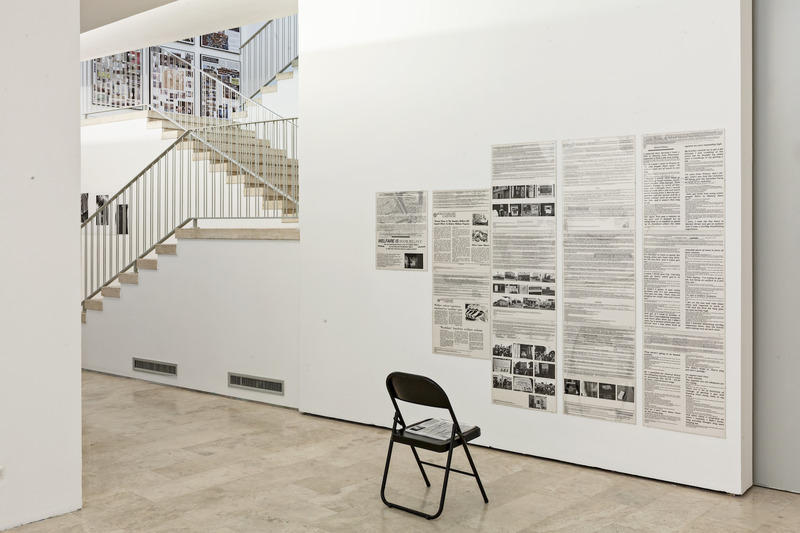 Next to the wide-ranging selection of artworks exhibited at Istituto Svizzero di Roma, following Lonidier’s practice of installing artworks in spaces of ongoing social struggle and union organizing, some of his works will be shown in the meeting room of CLAP, the Council of Freelance and Precarious Workers. CLAP was established in 2013 to defend workers who lack protection at their workplace or who have lost their jobs, and freelancers and precarious workers who are not entitled to welfare. Strike is organized by Istituto Svizzero di Roma in collaboration with CLAP – Camere del lavoro autonomo e precario, Centre de la photographie Genève, and Zürich University of the Arts. The exhibition is part of the project series Openings Out to Reality, in connection with the exhibition THE STREET (Est1863) by Tobias Kaspar. Openings Out to Reality is a project cycle initiated in 2012 by Istituto Svizzero di Roma whose aim is to research the interaction among the arts, its institutions and society at large. Born in 1942 in Lakeview, Oregon, Fred Lonidier is an artist, activist and union member. He taught photography at the University of California, San Diego, where he lives. His works have been exhibited in art institutions and community spaces including the Oakland Museum; the Whitney Museum of American Art; the New Museum of Contemporary Art, New York; the Los Angeles Institute for Contemporary Art; the San Diego/Imperial Counties Labor Council; the Amalgamated Clothing & Textile Workers, Los Angeles; the Ironworkers Union, Local 627, Norwal; and Centro Cultural de la Raza, San Diego, among many others. Recent group exhibitions include: inSite_05 San Diego/Tijuana transborder mobile archive project (2005); The Whitney Biennial 2014; Not Yet On the Reinvention of Documentary and the Critique of Modernism at Museo Nacional Centro de Arte Reina Sofía, Madrid (2015).